Elderberry (Sambucus canadensis), common elderberry or American elder, is a shrub that is commonly found throughout eastern North America. Its characteristic clusters of small, cream-colored flowers are often seen on the road-side in late spring and early summer. Elderberries have opposite, elongated, toothed leaflets that are three to four inches long. The rounded flower clusters, also called elderblow, may be six inches or more. Common elderberries bear clusters of small dark purple berries that ripen mid-summer to early fall. The only edible parts of the elderberry are the berries and flowers. Leaves, stems, bark and roots are very toxic, so it's important to be vigilant about not including any of these when preparing elderberry for food. The berries, bark and leaves have been used traditionally in medicinal preparations. 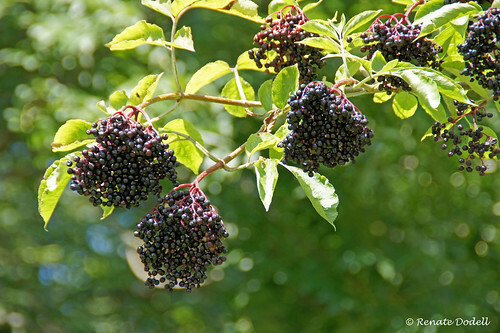 Watch out for Hercules' club which bears leaves and poisonous black berries that resemble those of elderberries. Hercules' club's berry clusters are flat instead of round, and the stems are covered in thorns, while elderberry is smooth. 8 years ago ago at Kefermarkt, Upper Austria, Austria by Renate Dodell. Elderberry fruit clusters. Photo by dorena-wm. When preparing the fruit of elderberry, it's important to only use ripe berries as unripe berries are poisonous. Raw berries cause stomach distress in some people so it's best to cook them before eating which also improves flavor. After harvesting berry clusters, remove the berries from the poisonous stems and put into a bucket of water to help separate berries from debris. The water can then be poured off. The berries can be baked into pastries, cooked into a syrup or dried for later use. Use elder flowers fresh or dried in teas and infusions. Elderberry thrives in a variety of conditions. It can be found along streambanks, in moist woods, open fields and power line cuts. To harvest, simply cut off flower or berry clusters with scissors, keeping in mind that flowers develop into berries--harvesting flowers will detract from berry production. It's challenging to get berries before they're picked off by birds. When planning to harvest berries, it's a good idea to watch as they ripen and pick as soon as they're ready.